A $1 BILLION light rail network linking Parramatta and Strathfield via Sydney Olympic Park is set to be approved, turbocharging the city’s sports and ­entertainment mecca. The new light-rail service would fuel billions of dollars in housing and job-creating projects along its route, including a $1 billion town centre with shops, restaurants and offices on 5ha in the heart of the Olympic precinct. The move would shore up the future of ANZ Stadium, with long-term plans being drawn up to convert the former Sydney Olympics venue into a permanent rectangular colosseum with every seat moved at least 20m closer to the action. Unfortunately, it looks like a property tax not a land tax. A property tax falls on buildings (and often land as well), whereas a land tax falls only on land values. It also looks like it applies only to new developments (for political reasons), so existing landowners will get a free value boost, and because the 'base' of the tax is narrower, one would expect it to be higher than if it were spread to ALL properties. On the flipside, local council rates will be increased, hence a way around this problem is to ask for a contribution from the local council for the line. Would it hurt housing affordability? Unlikely. If the rail line is placed in, property values will increase, so it will be more expensive to buy a property anyway. I quite like this route, as it takes LRT into areas between Strathfield and Parramatta that are ripe for redevelopment but too far from the existing heavy rail. And a massive thumbs up for doing something with the Carlingford line, which is a similar low service level mess to our Doomben line. Hopefully we'll see this system extend beyond Carlingford to Macquarie Park via Epping in the medium term. While Epping - Macquarie Park has the ECRL / future NorWest Metro, the surface transport in that area is diabolical and the train is really only used by those working/studying in the immediately walkable area around the stations. Can't comment about the Bankstown option on the map, but having used the Castle Hill to Parramatta service (Westbus), something there in the longer term is a good idea too, although perhaps just more T-ways. The existing Castle Hill to Parramatta bus service is a real drag, and basically only attracts those who are captive to the public transport system. Given growth of Castle Hill as a major node, something linking Castle Hill and Parramatta is mandatory in the next 20 or so years. I guess that original tramway/rail line to Castle Hill, that closed before WW2, was just ahead of its time. It's great how they are converting the Carlingford line to light rail Makes sense! Doomben line conversion to light rail? The state government remains “totally committed” to the Parramatta light rail project, according to Parramatta MP Geoff Lee. It was revealed this week that planning is underway for a new metro line between the Sydney CBD and Parramatta, which may include service growth areas, such as the Bays Precinct around Rozelle and the former industrial lands at Camellia. The route may also include a future expansion to a Badgerys Creek airport and an eastward expansion to Maroubra and Long Bay. But the news has sparked speculation the line will be at the expense of parts of Parramatta's planned light rail network, though it is understood no decision has yet been made on that idea..
Mr Lee reiterated his state government remains committed to building the billion dollar light rail project. “Parramatta Light Rail is going to transform our city and suburbs,” he said. Sydney Business Chamber Western Sydney Director David Borger welcomed a possible metro connection between Parramatta and Sydney. “Western Sydney has been held back by lack of access to jobs and lack of investment in the region’s transport,” he said. Western Sydney Leadership Dialogue chairman Christopher Brown supports a metro rail line from the CBD to Parramatta/Westmead but believes it needs to be part of a total public transport solution that includes light rail. “We have three rail priority projects and will not be forced to choose between them as every one is vital to employment generation, liveability and to reduce congestion,” Mr Brown said. Mr Brown doesn’t believed the latest news poses a threat to light rail. “As the second CBD of Sydney, Parramatta fully deserves a fast Metro link to the city and I am grateful that private sector proponents and government agencies are considering a line that would double the capacity between the two city centres,” he said. The cost of Mike Baird's signature public transport promise for western Sydney has ballooned to more than $3.5 billion – $2.5 billion above what has been budgeted, secret government documents show. The Parramatta light rail project is the centrepiece of the government's plans to cement Parramatta as Sydney's second central business district, as well as its proposal this week to build thousands of apartments around Sydney Olympic Park. But only $1 billion has been allocated for a project which, according to a preliminary business case obtained by Fairfax Media, is costed at more than $3.5 billion. The Premier Gladys Berejiklian has unveiled the route for the first stage of the new Parramatta light rail, which will stop at 16 places across the city. The rail project will be built in two stages, with the first leg - a 12-kilometre route connecting Westmead to Carlingford via the Parramatta CBD - to open in 2023. Announcing the route on Friday, Ms Berejiklian said the project confirmed the government's commitment to the city of Parramatta. "This is a project that will not just connect major parts of Greater Parramatta but also revitalise communities and help create new ones," Ms Berejiklian said. However, the Premier and Transport Minister Andrew Constance were forced to defend their decision to drop Olympic Park, which suffers from a major transportation issues, from the first stage. Mr Constance said the government was "absolutely" committed to extending the light rail to Olympic Park and said the government would "do its homework" before deciding the route of stage two later this year. "We want to get the station locations right, and the design of the route right," Mr Constance said. Ms Berejiklian said the she was aware transportation around Olympic Park was "a major issue". Opposition leader Luke Foley accused the government of abandoning residents and businesses in the area. "The Liberals have walked away from light rail to and from Olympic Park," Mr Foley said. The government has committed $1 billion in funding for the project. The business case is yet to be finalised, but the remaining funded is expected to be a mix of so-called value capture and additional contributions from the public purse to pay for the new line. I don't know. It is kind of parallel to a railway line. Maybe they should upgrade the rail line or put a metro in that rather than LRT. At least $1 billion in funding still needs to be found to complete the Parramatta light rail project, leaked internal documents show, meaning the Berejiklian government could be forced to double the money it has reserved in infrastructure funds. A cabinet-in-confidence document dated March 2017 obtained by the opposition reveals the total cost of the project at $3.41 billion – $2.41 billion more than the $1 billion set aside from the Restart NSW and Rebuilding NSW funds. Separate documents from May last year, obtained by Fairfax Media, reveal Transport for NSW estimates $1.3 billion will be raised from "value capture" – a levy on property development along the rail line previously put at $200 per square metre of gross floor area. The Transport for NSW Finance and Investment committee document states: "Balance of funding to be sought from other funding sources including Federal." This leaves no determined funding source for $1.1 billion required to complete the project, with stage one from Westmead to Carlingford via Parramatta CBD due to open in 2023. Planning work is under way for stage two, from Camellia to Strathfield via Sydney Olympic Park. Labor's transport spokeswoman Jodi McKay called on the government to release the business case – which the documents show was due to be completed by May – to show how the project will be funded. Last year Fairfax Media revealed a preliminary business case had put the total cost at more than $3.5 billion. "This is a government that's constantly boasting about how good they are at infrastructure when the exact opposite is true – they are still short more than $1 billion and that's after they have slapped a $1.3 billion tax on Western Sydney," she said. "The people of Western Sydney are already being slugged with unfair and unaffordable tolls and now they have to pay an extra tax for their light rail while the people of the Eastern Suburbs get theirs for free. It's a tale of two cities." However, transport minister Andrew Constance said: "There can't be a funding gap when we haven't finalised the total project costs". "We have already put aside $1 billion to get this project under way and have always been upfront that the project cost will be more than this," Mr Constance said. "We will confirm a delivery model and investment decision in the coming months, after consideration of the final business case." A Transport for NSW spokesman said the government was looking at "a range of funding sources to meet the capital cost of the project" including the development levy, which will also fund new schools and road upgrades. He said $3.41 billion was "an early estimate made well before the program was broken into two stages, and is a total cost estimate for the entire network extending more than 20 kilometres from Westmead to Strathfield via Olympic Park". More than 40 homes and businesses along the 12-kilometre route of the first stage of the new Parramatta light rail line will be compulsorily acquired and another 78 are earmarked for partial purchase for the multibillion-dollar project. Parramatta's well-known "eat street" al fresco dining strip along Church Street in the central business district also faces significant disruption while two rail tracks are laid. Transport Minister Andrew Constance has announced details of the environmental impact statement (EIS) for Western Sydney's light rail project. Construction on the first stage of the line that stretches from Westmead to Carlingford via Parramatta's CBD and Camellia is due to start in the middle of next year and take as long as five years. Trams are scheduled to start running in 2023 along the route which will feature 16 stops. The environmental impact statement for the first stage, released on Wednesday, also reveals that hundreds of trees of varying sizes are set to be pruned or felled, and almost 700 car parks permanently removed. Those businesses targeted for acquisition include the popular Royal Oak Hotel on Church Street. But Transport Minister Andrew Constance urged people to keep in mind the "big picture" of the benefits a public transport project of the size of the light rail line would bring to businesses and residents. "This is a gamer changer for the west. [But] when you build major infrastructure, unfortunately property acquisitions come into play," he said. Mr Constance said one of the "great challenges" of the first stage would be reducing disruption to businesses along the restaurant-lined Church Street from construction. The government has come under fire from the disruption caused to businesses from the $2.1 billion light rail line from Circular Quay in Sydney's CBD to Kensington and Randwick in the south-east. "I hope they have learnt from what happened in the CBD," Labor's transport spokeswoman, Jodi McKay, said. "They are already foreshadowing that this is going to have a negative impact and they need to get this right." The project will also result in significant change to bus stops and routes, and roads in and around the planned light rail line. Parts of Church and Macquarie streets in Parramatta's CBD will be closed to traffic, resulting in them becoming pedestrian zones. Four new bridges will be built for the line, and five existing bridges widened or modified. 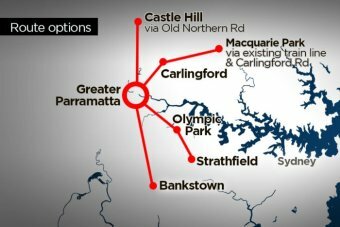 The T6 Carlingford heavy rail between Parramatta Road and Carlingford will be closed and replaced by light rail. Ten Aboriginal archaeological sites along the route have also been identified. Test excavations found intact artefacts at five of the sites, and "salvage excavations" will be undertake at four of the five sites. The 45-metre light rail vehicles that will operate on the Parramatta line will be longer than the 30-metre trams on the inner west line from Central Station to Dulwich Hill. However, they will be shorter than the 67-metre tram sets that will run on the other new line under construction from Circular Quay to Sydney's south east. The government has set aside $1 billion for the first stage of the Parramatta light rail line, while it will also impose a special infrastructure contribution on new developments along the route. The contribution will amount to about $200 per square metre for new residential developments. Funding from the levy will also go towards infrastructure, such as new schools and road upgrades. However, Mr Constance said other special levies such as an annual $110 fee on property owners in Parramatta would not be imposed. Planning documents have previously put the total cost of the entire Parramatta light rail project at more than $3.5 billion, which was originally to be built in one fell swoop as far as Strathfield. However, the government later decided to build it in two stages and will not reveal the final cost of the first part until after a contractor has been signed up. Mr Constance said it was "too early to tell" whether the second stage of the light rail would extend as far as Strathfield, saying it would depend on plans for the proposed $20 billion metro rail line from Sydney's CBD to Parramatta. "I don't want to create a light rail route that in essence runs along the metro route – that is just silly," he said. Details about the route for stage two of the light rail line will be released later this year. Each tram on the new line will be able to carry up to 300 passengers, and operate between 5am and 1am seven days a week. Parramatta Light Rail program director Tim Poole said his team had been talking to affected property owners since the route was revealed in February. "Obviously no one likes to be acquired but what we have is a process underway now where we are giving everyone a fair go," he said. "We won't pretend to think that the construction period won't be tough [for the al fresco restaurants along Church Street]." PLANS to tackle Western Sydney’s commuter crisis are on track with Parramatta’s new “congestion busting” light rail route. The revised $900 million stage two blueprint, revealed exclusively today by The Daily Telegraph, takes in suburbs previously starved of transport links to the river’s north and includes a surprise river crossing. “The NSW government is busting congestion with Parramatta Light Rail stage two,” Transport Minister Andrew Constance said. The new 9km link would pass through Ermington, Melrose Park and Meadowbank before crossing the river and heading to Wentworth Point, Silverwater and Sydney Olympic Park. “We have done our homework and we know that a route north of the river makes the most sense and provides the best public transport uplift,” Mr Constance said. “It will get people from suburbs north of the river off buses and onto a quick transport link that will deliver them to future Sydney Metro West underground stations, heavy rail in Parramatta and Olympic Park, and ferry services at Rydalmere and Olympic Park. The proposed new line will connect with the $1 billion first stage at Rydalmere and will include a rail and cycle crossing of the river. An alternative route from Camellia to South Street is also an option and would also involve a second river crossing. “We’ve invested $1 billion to get stage one of Parra­matta Light Rail from Westmead to Carlingford under way and we are not stopping there. Stage two is now also a reality that we are planning for, meaning a total transformation for Greater Parramatta is just around the corner,” Mr Constance said. The second stage would have 10-12 stops with travel times of around 25 minutes from Olympic Park to ­Camellia before joining with the first stage for a further eight minute ride to Parramatta CBD. “It gives people another transport option to get to Sydney Olympic Park,” said Mr Constance, who is expec­ted to discuss the future ­revamp of ANZ Stadium with cabinet tomorrow. Tax consultant Lily Kong, 23, currently drives from her home at Dundas and parks at Olympic Park for any sporting events. “Driving is a hassle, parking is a hassle, I cannot wait for a light rail link to Olympic Park,” she said. Five consortia consisting of the world’s best light rail builders and operators have been shortlisted for two contracts to deliver Stage 1 of the Parramatta Light Rail project. Minister for Transport and Infrastructure, Andrew Constance, announced the shortlists for the two major contracts for the project, including Australian and international light rail companies. BUILDING on Parramatta’s $1 billion light rail project will start before the end of the year after the project secured the green light from the council. The first stage of the 12km twin track will link the booming Westmead health precinct and Carlingford through Parramatta and carry up to 300 passengers between 5am and 1am seven days a week when it opens in 2023. “Parramatta light rail will create close to 5000 jobs, connect communities along the route and transform the way that people explore all the ­attractions that Western Sydney has to offer, with a light rail service every 7.5 minutes in peak periods,” Premier Gladys Berejiklian said. 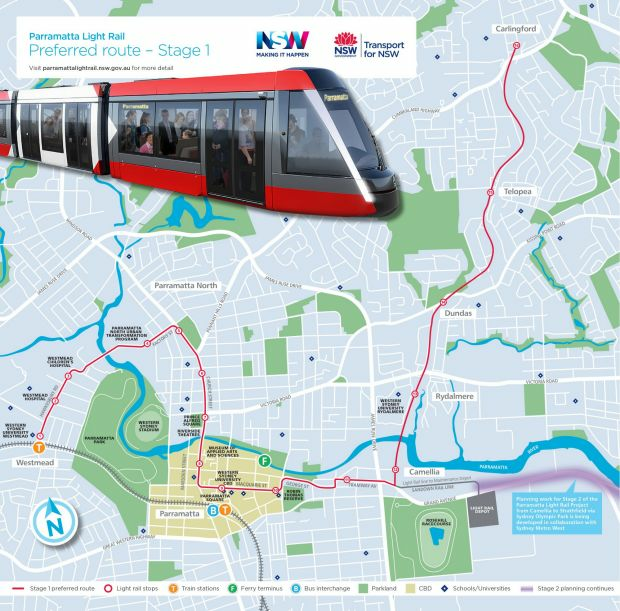 As well as linking hospitals at Westmead the light rail will connect to the new Western Sydney Stadium, three Western Sydney University campuses, the relocated Power­house Museum, Riverside Theatre, Rosehill Racecourse, and residents at Camellia and Telopea. The Daily Telegraph’s Project Sydney campaign has called for a firm timetable for the project — including the critical stage 2 extension through to Sydney Olympic Park — and for protection for Church St businesses facing the same disruption that ­unfolded in the CBD. The government has allocated $1 billion to stage 1 of the project and the full cost will be revealed when contracts are signed later this year. A final business case for a planned stage 2 is due by the end of 2018. Parramatta MP Geoff Lee said more than 72,000 new homes were planned for around the central city over the next 20 years. “Parramatta light rail is an essential part of our plan for this growth,” he said. Minister for Transport and Infrastructure Andrew Constance today confirmed the final budget for the project as $2.4 billion, which includes the two major contracts, early and enabling works, road network upgrades, new bridges and active transport links, urban design, changes to the bus network and project costs from 2015-2023. Mr Constance said the successful consortia have a demonstrated history of delivering successful light rail projects around Australia. “We are excited to confirm the NSW Government is investing in not one but two experienced consortia to deliver us a world-class light rail,” Mr Constance said. The $840 million major contract to build the light rail system has been awarded to Downer and CPB Contractors in a joint venture, while the $536 million contract to supply and operate the network and build the depot, light rail stops and power systems has been awarded to the Great River City Light Rail consortium. The Great River City Light Rail consortium includes Transdev, the operator of Sydney’s Inner West Light Rail, and CAF Rail Australia, which supplies vehicles for the Inner West and Newcastle light rail networks. “Both consortiums’ proposals for Stage 1 clearly demonstrated a strong appreciation of the needs of the customer and the community and the importance of connecting great places in the Greater Parramatta region,” Mr Constance said. “We will also be bringing new business to Parramatta – for example, Great River City Light Rail will operate from its future base in Camellia, with a permanent workforce that provides opportunities for local jobs. Member for Parramatta Geoff Lee said the Parramatta Light Rail was a key addition to the public transport network in Greater Western Sydney given the area’s growth. “We could not have achieved this without the tremendous support of the community, who have given us such valuable feedback and ideas over more than three years of planning and design,” Mr Lee said. After feedback from the local business community, the NSW Government previously made clear that main construction works on Eat Street will not begin until 2020. The NSW Government also confirmed that a construction grace period will apply on Eat Street each summer, from the beginning of November until the end of January. Built into the contracts are requirements for construction teams to work around evenings and other busy times, a commitment to employ local workers and penalties if works are significantly delayed. The Parramatta Light Rail will begin operations in 2023, offering a “turn up and go” service that runs every 7.5 minutes during peak periods. The 45-metre vehicles will be fully accessible and can carry up to 300 passengers each. Remediation works began in October at the site of the future light rail Stabling and Maintenance facility at Camellia, and roadworks to prepare the Parramatta CBD and North Parramatta by redirecting traffic flow are underway. Transport for NSW has signed agreements with the City of Parramatta, other government agencies and the major utility providers, which define responsibilities and working arrangements during construction and operations. Businesses have urged the state government to fast-track the second stage of the multibillion-dollar Parramatta light rail line to Sydney Olympic Park, fearing it will be delayed. The pleadings come as Transport Minister Andrew Constance says businesses and residents along the route of the first stage of the new line through Parramatta will be spared major disruptions which have plagued construction of a $2.1 billion light rail line in central Sydney. Major work on the first stage from Westmead to Carlingford via Parramatta's CBD – which will cost $2.4 billion − will start next year, after the government awarded two major contracts. Construction will start next year on the first stage of Parramatta's light rail line. 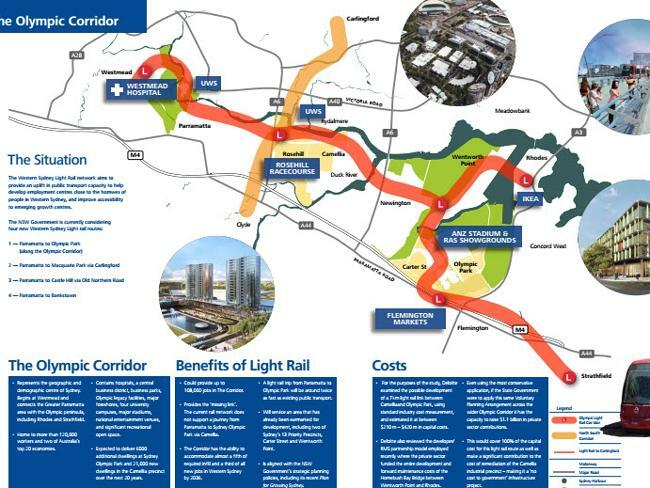 It prompted businesses to urge the government to release the business case and concrete timelines for the building of the second stage of the light rail line linking Parramatta to Olympic Park via Rydalmere, Melrose Park and Wentworth Point. "The communities along the Parramatta River have missed out on good public transport for too long – let’s not make it any longer by delaying the new light rail," said David Borger, the Sydney Business Chamber's western Sydney director. "We will always be concerned about the second stage [going ahead] until the business case is adopted." The government will not reveal the cost of the 9-kilometre second stage until contracts are awarded. A leaked government document in 2016 estimated the cost of the entire project at more than $3.5 billion. Mr Constance said the government was committed to building stage two because it was vital the line was extended to Olympic Park where it would link to a proposed metro rail line. He has previously said he was hopeful construction will start before 2020. Following concerns from restaurants and cafes, the main work on the light rail along "Eat Street" in central Parramatta will not begin until 2020, while the popular al fresco dining strip will be spared construction over the busy summer periods from November to January. Contractors will also be required to work outside evenings and other busy times, and will face penalties if construction is delayed significantly. The first stage is due to open in 2023. Mr Constance sought to allay fears that the disruption experienced by businesses along George Street in central Sydney from light rail construction will be repeated in Parramatta. "Eat Street is not George Street. It is obviously not going to have the same degree of utilities under Eat Street that we have under George Street," he said. "There have been lessons learnt along the way." Utilities under George Street have been blamed for the major delays to construction. The light rail line will be "wire free" for about 4km of the 12km track between Westmead and Cumberland Hospital, and through Parramatta's CBD from Prince Alfred Square to Tramway Avenue. Despite Spanish builder Acciona recently warning the opening of Sydney's light rail could be later than May 2020, Mr Constance said recent progress on construction made him "very confident" that the line from Circular Quay to Sydney's south east would be operating next year. "The worst of the construction disruption is now behind us," he said. "I am confident given the progress that we are starting to see that we will have the delivery of light rail with passengers on it in George Street come 2019."